The planters were men who had abandoned Enlightenment era France for the possibility of huge profit and reward as a result of hacking some kind of living out of the wilderness. Sugar, as it turns out, was the right crop for the areas directly west of New Orleans, that ran along the northern banks of the Mississippi River. This area, named the “German Coast,” was famous for its heat, humidity, snakes, swamps, and many planters justified the use of African slaves as a result of this harsh environment. The transport of slaves to the United States was outlawed in 1808, but it is estimated that in the forty years prior the passage of the law proscribing importation of slaves that as many as 24,000 Africans were disembarked in New Orleans. The mortality rates of the slave trade are staggering. Forty percent of those captured never even made it to the west coast of Africa for transportation, ten percent perished during the Middle Passage, and only about a third would survive through the first four years in the New World. There is another side to this, though, and it shouldn’t be overlooked, many of those transported and who survived were some very tough customers indeed. The two slaves most associated with the German Coast Revolt are Kook and Quamana. The names suggest that the men were Akan, an African empire at the height of its power in the late eighteenth century; essentially a military union of a number of different tribes. The Akan controlled significant tracts of land throughout modern Nigeria, Benin, Togo, and Ghana. Many of the Akan slaves brought to the US were common soldiers who had been trained to make up the impressively large armies that African nations at that time fielded in warfare. It is likely, therefore that Kook and Quamana at least knew how to use weapons, and very probably had been trained to fight, even if they had never gone into battle. The real touchstone for the revolt, as it was for John Brown, was the success of the Haitian Revolution in 1803, which, as noted elsewhere freed the slaves, granted independence to the island nation, and as if to put paid to the whole deal banned all French citizens from Haiti – forever. News and refugees from Haiti flowed into Southern US ports, and New Orleans had its share of hair-raising accounts of slave violence and degradation told by disgruntled plantation owners and lackeys who lost it all when the rebels occupied Port-au-Prince. The planters of the German Coast were stunned, and in response formed many local units and militias specifically to respond the possibility of a slave rebellion. Of course, 1803 fits prominently into the story in another way, for as Napoleon was losing his colony, the US president Jefferson was eyeing the possibility of buying some fire sale real estate in the Gulf Coast area. Jefferson sent Robert Livingstone to France, who negotiated the purchase of Louisiana (effectively a third of the United States – from New Orleans to Montana, roughly) for 15 million dollars, just nineteen days after beginning negotiations. Livingstone accepted the offer without having first contacted Jefferson, assuming that he would approve, which he did a few weeks later. Jefferson sent William Claiborne to be its first territorial governor, and he could not have chosen more poorly. Claiborne was a true patriot, small-minded, leery of foreigners, unable to speak French or Spanish and uniquely unsuited to handle the arrogant French planters. At a ball he attended with some of his kaintucks (Creole patois for American, not flattering) he called for a few English dances prior to the traditional French ones and nearly started a riot. So things simmered along nicely for a few years, with silent communication among various slaves and groups, facilitated by the balls and events of the masters, continuing as did planning and waiting for the right moment to strike. In this period the final, and perhaps the most interesting member of the revolt was recruited, Charles Deslondes. Charles was a light-skinned, mixed race man born on the Deslondes plantation and hence given the master’s last name. He had risen swiftly through the slave hierarchy to become a driver, the person responsible for taking orders from the master and translating it into the days work for the slaves. The slave drivers were notoriously conservative and traitorous to the cause of slave rebellions, and were one of the reasons that so few revolts ever really got off the ground, as they informed quickly on any potential plots. The slave drivers did everything from carrying keys to all the doors of the plantation, to supervising the complex process of extracting and granulating sugar from cane juice, to handing out punishment to recalcitrant slaves. It also seems that the drivers were often the vehicle whereby discontented slaves could air out grievances without resorting to murdering the master. Many times slave drivers sought to smooth over tensions between slaves and masters and in this sense were the very epitome of collaborationists, but not Charles Deslondes. He continued to play the role of driver but in his heart there was rebellion, and he was perfectly situated at his master Manuel Andry’s plantation to light the flame of revolt. Andry as it turns out was notorious for his cruelty to his slaves and this in turn may have been one of the reasons that Charles was pushed into rebellion. It is also a nice anecdotal refutation of Marx’s class theory, as Zerzan and others have pointed out, and as history repeatedly shows, those with the most to lose often make the deepest and most radical revolutions. Regardless, when the time came for the signal Deslondes wouldn’t look back for an instant. News and plans passed up and down the German Coast through a political cell organization constituted of like-minded slaves, cells of those recently imported from Africa, and a large cell of English speaking slaves. No written plans were ever discovered after the revolt had been put down. Other than freeing the slaves, we can only guess as to the larger goals of the rising. News and plans passed up and down the German Coast through a political cell organization constituted of like-minded slaves, cells of those recently imported from Africa, and a large cell of English speaking slaves. No written plans were ever discovered after the revolt had been put down. Other than freeing the slaves, we can only guess as to the larger goals of the rising. One guess is that as New Orleans was the nearest and largest city, and a hub of power and commerce, and as the slaves immediately set out towards the metropolis that there was at least a thought as to a wider political agenda. Capturing the city was certainly on the minds of many of the co-conspirators. In interrogation the captured rebels were silent, they knew that whether or not they talked, they would all die, so there was little motivation to snitch. One slave under interrogation stated that the goal was to kill all the whites. Possibly, but it also has the ring of planter propaganda to justify the bloodbath and decapitated heads on poles that were the final stop of many of the revolutionaries. At a meeting of three of the conspirators during the Epiphany celebrations it was decided that January 8, 1811, a Thursday, would be the date to turn their world upside down. On the night of the eighth Charles summoned his cell of 25 slaves together and made some final plans and adjustments. The decision to open the battle at the Andry plantation was tactical and symbolic. The Andry plantation was virtually the last outpost before the Mississippi banked north and away from the German Coast. It was the furthest from New Orleans as well, meaning that the rebels would travel down through a virtual alley of plantations, and potential recruits before facing the earthen walls of the city. Charles led the slaves into the Andry mansion, where Manuel and his adult son Gilbert were sleeping. The night had been rainy, and hence the movement of the rebels had been effectively covered by the wind and splash. Awakening Manuel the rebels attempted to capture or kill him, but Andry understanding instinctively what was happening ran through the milling rebels receiving a number of superficial slashes as he did so, he continued down the staircase and did not stop until he made the next plantation. Deslondes felt that he couldn’t make it too far in his wounded and scared condition and so did not order a chase. Deslondes was convinced that there was indeed to be a reckoning with his former master and was willing to wait for that moment. Survival, however, was not in the cards for the son, Gilbert was hacked to death by his former chattels. The liberated slaves formed themselves into marching columns, Deslondes rode a horse commandeered from the Andry stable, and said, “On to New Orleans.” And so the march began. The seed of rebellion had been well planted, as the insurrectionists passed plantation after plantation the various slave quarters were abuzz with the debate as to whether to join, or to stay behind in safety. In rapid succession small cells, well primed with revolutionary slogans and bearing all manner of farm implement as weapons, sprang out of the rain and gloom to join the marching rebels. At one plantation owned by the local judge, Achille Trouard, the rebels were greeted by ten slaves, one of which, a man named Mathurin, was on horseback. As they marched to within earshot they saw Mathurin wave a sword high in the air and pledge life and limb for the cause of Charles and revolution. Mathurin had bad news too. Seems his master had been warned and managed to escape with the entire Trouard family into the swamps that surrounded the well-groomed sugar fields. Not only were the slave lines of communication open and humming, the planters were just beginning to get a sense that something very wrong was descending on New Orleans from the German Coast. Treachery also begins to play a role in the Revolt at this time too, as collaborationist slaves began to inform their masters of the plot and encouraged them to either flee to New Orleans or hide in the swamps. The rebels moved to within a few miles of New Orleans as the guardians of law and order finally started to make some plans as to how to deal with the looming threat. Claibourne and the other government representatives were less concerned with the distant army than they were by the fact that blacks – free, slave, and indentured – outnumbered whites in the city by almost two to one. As the rebels drew nearer to New Orleans a new type of discontented, racially ambivalent population, the maroons, joined the army. These men and women were slaves, indentured whites and dispossessed Native Americans who had escaped into the wilderness and swamps and lived in a continual uneasy stalemate with the local white gentry. As such they were well acquainted with the region and knew just where and when a retreat into the bayou would yield effective escape from the planters, should the rebellion backfire. The maroons were also handy with gun and pistol, and given the chance could make every shot count. Much has been written of maroons and maroon societies, John Brown was fascinated by them and used at least one or two maroon uprisings as guides when he was crafting his own rebellion. The maroons were notorious for not only being dangerously alienated from the surrounding dominant culture, they also looked upon the local variations of racism as a curse. In most maroon communities blacks, Native Americans and whites mixed in easy company as fighting companions and sexual partners. It’s hard to imagine a more terrifying image to the local white gentry than the hundreds of risen slaves joined and abetted by the local maroons who inhabited the swamps and fens of the Mississippi delta region. The planters knew that should the rebels win, no mercy could be expected from the victors, and it steeled their response to the rising to the point of becoming uncontrollable cruelty. Kook and Quamana were waiting at the plantation of the Trepagnier’s, and their absorption into the rebel force heralded the final addition of conspirators. The rebellious army was complete, time to begin moving in a determined way towards New Orleans, and battle, and freedom. Francois Trepagnier, not fearing any slave – he considered them some kind of animal, and even kept a small boy named Gustave as a pet, throwing him scraps from the table for amusement – loaded up some shotguns, set himself in the second story window of his mansion and waited. What he saw advancing in the early morning air was the stuff of planter nightmares, several hundred slaves, organized into companies and each commanded by a black officer on horseback. Francois had made his decision and started firing as rapidly as possible into the marchers. Kook ran quickly around to the undefended rear of the house, broke down a door and ascended to the second floor and set about hacking the planter to bits. One early myth of the rebellion is that Gustave, Trepagnier’s erstwhile pet, was given an ax by onlookers and that he too exacted revenge for the years of abuse he had suffered at the hands of the white vermin who “owned” him. The conspirators organized the lines of marchers more tightly and using their knowledge of war gained on the African continent set off to bring freedom to the American gulag. The night had grown quite late and many in the rebel army were for slowing or even resting prior to the assault on New Orleans. At about the same time a small group of younger male slaves joined the throng. This cell, headed by a man named Simon, brought with them new energy and were eager to get to New Orleans and finish the job. Their enthusiasm proved to be infectious and the entire army caught a second wind for what might well become the last day of the rebellion or the first day of real freedom. The murder of Francois Trepagnier had been very much a test for the rebels. In it they had killed one of the most hated planters on the German Coast and it was hoped that rumors of the execution would spread far and wide to instill in their foes the fear and doubt needed to overcome the well armed and trained white militias. The rebels moved to within a few miles of New Orleans as the guardians of law and order finally started to make some plans as to how to deal with the looming threat. Claibourne and the other government representatives were less concerned with the distant army than they were by the fact that blacks – free, slave, and indentured – outnumbered whites in the city by almost two to one. What the men really feared was a simultaneous assault from the rebel army without and a race riot within the cities gates, effectively opening a second front that would have made holding the town virtually impossible. The governor and his men quickly cut off all slave movement across the bridges in the hopes that this would eliminate communication between the belligerents. Next Claibourne closed all the drinking establishments in the city, judging perhaps rightly, that the loose company and morals of the bar denizens might flow forth in new lines of contestation and violence. Simultaneously the movement of refugees into New Orleans began to swell from a few stragglers to hundreds of plantation owners and their families, employees and skilled white laborers, all assisted in their flight by collaborationist slaves. Over the next six hours General Hampton, the local militia commander managed to organize two companies of the local militia and thirty regular soldiers who had been stationed in the city as a sort of police/surveillance detachment. The naval commander, Commodore Shaw, realizing the weakness of Hampton’s forces, and also knowing that his ships would be worthless in the still pouring wind and rain took the decision to disembark his sailors and to turn them into infantry. As these various official contingents began to encounter the planters fleeing towards the city, they found that once the masters had found safe accommodation for their family, possessions, and slaves, they would sometimes turn their horses around and join the various military units. In this way a company of cavalry appeared virtually out of nowhere and strengthened even further the ability – and the will – to resist the oncoming forces of rebellion. The various military detachments headed out back into the German Coast, at one time coming across a large contingent of rebels sheltering between two buildings used for sugar extraction. Thinking this group to be the entire rebel force, plans were laid and infantry and cavalry charged into the midst of the gathered slaves. It was too late, though. The rebels – undoubtedly hearing the men and horses – had evaporated back into the night, a classic guerilla tactic, and from “untrained slaves”: fight only if you can win, move away if overpowered or outgunned or outmanned. The slave army began to move quickly back into the dark and fog of the German Coast, away from the erstwhile prize of New Orleans. Again, classic guerrilla strategy: move the enemy into your environment, where you know the placement of every tree and sink hole, and then exhaust and kill them. Make the enemy chase you, preferably in the dark when a musket aimed from behind a tree can do as much damage as it can on a well lit battlefield, but where there is no cover from incoming bullets. The final act was orchestrated upriver by the one man that the slaves had let live, and shouldn’t have. Manuel Andry, bleeding and half-dead, and after the slaying of his son made his way across the river to the home of Charles Perret. Here he was bandaged and gathered a force of about 80 planters, all armed to the teeth and motivated by the raving Andry who predicts the worst if the slaves – any of the slaves – are left alive. This force then traveled back to the other side of the river and waited, knowing by way of the sounds of shooting and movement that the rebels are heading directly for them, back up the river. At about nine in the morning of January 9, 1811 the planters watched as the rebel forces marched straight into the trap. The planters had effectively flanked the slaves to the rear and none of the slave strategists could have guessed that any German Coast resident, especially the wounded and howling Andry, could mount a counterattack after the mayhem which the rebels had caused as they began their march on New Orleans. Once sighted by the rebels, the battle was joined. Each group drew up into battle formation with slaves outnumbering the forces of law and order by two to one. Neither side hesitated nor flinched, the rebels and planters knowing that whoever won would take a terrible vengeance on the vanquished. Within the first few minutes of battle, however, the victory was assured for the planters as the ammunition of the rebels began to give out. More and more black bodies fell in the early morning light, and finally the planters’ cavalry, charged into the wavering lines of rebels. Many of the rebels stood their ground, and the remainder headed to the swamp with hopes of getting past the screaming white banshees. In their ears they could hear the screams and cries of their brethren being dismembered by the Christian patriots. Only about 25 slaves survived to actually be put on trial, including Kook and Quamana. The planters had brought with them their slave-chasing bloodhounds and these led the planters into the depths of the swamp and right onto the heels of Charles Deslondes. He did not escape. According to one witness the militiamen chopped off Charles hands, broke his thighs, shot him dead, and then roasted his remains on a pile of straw. Charles died a martyr to his cause, and his death cries, heard by captured and hiding rebels alike carried the message of a freedom won and stolen back in a few short hours. Reprisals continued unabated for several days, as the militia continued their hunt for rebel slaves. Upon capture the militia did more than murder their prey, they hacked off the heads of the captured rebels and delivered them, by the sack, to the Andry estate. From there the heads were taken to points all along the German Coast and placed on poles. In cases where rebels were captured, a truncated judicial proceeding was planned and implemented. Kook and Quamana survived the initial bloodletting in the cane-fields turned killing fields. The planters had a special plan for these men who, by virtue of their military dress, were easily implicated as being in the leadership of the rebellion. In all some 18 further slaves were found guilty, though of what is missing from the records. The charge could have been anything from fomenting insurrection, or being black and desiring freedom, to just thinking for oneself. The glaringly blank space for what exactly the crimes of the rebels were, is one of the more interesting and ironic twists of this history. By the end of January around 100 dismembered bodies were displayed from the Place d’Armes in the center of New Orleans along the River Road for some forty miles into the heart of the plantation district. Of the many repercussions of the rebellion one of the more interesting is the change that it effected in the role and estimation of Governor Claibourne, and the rest of the kaintucks, in the perceptions of the planters. Where as before the arrogant Creole bourgeoisie had treated the local US representatives as yet one more group of claimants to power to be ignored and vilified, as they had the French, and the Spanish. This changed overnight into a recognition that the US, and especially its military arm could prove quite important if the slaves should ever rise again. Next, they also were not blind to the fact that regardless of the dubious legal machinations whereby a few hundred slaves had been murdered, no one in the American administration was willing to question, or even investigate what amounted to mass murder. All of this came to a head with a call for the increased militarization of the areas and white populations in and around New Orleans, and the results were rapid and long lasting. Within a week the militias, largely a decorative vestige attached to planters societies began to meet weekly and to practice in the arts of shooting, riding, and hanging. The Federal government rapidly followed in the wake of these local initiatives and dispatched, at the request of the Speaker of the House, three gunboats to New Orleans specifically to be available to put down slave insurrections. Additionally the Mayor introduced new regulations which addressed the issue of slave rebellions, including a tax on planters whose chattels represented such a threat to the peace and order to the community, this same legislation also held slave owners financially responsible for the behavior of their slaves. Claibourne disagreed with this initiative and it was never implemented. On the other hand Claibourne pushed the Federal government to reimburse the planters for slaves that had been murdered in the rebellion, and in the same way that Wall Street was bailed out some two hundred years later, this initiative was implemented and many of the planters did seek compensation for the slaves killed. The payment was capitated at $300 per male slave, and hence was not commensurate with the market value of the bondsmen, but it was better than nothing. The plantation owners thereafter became Americans, and so long as the government didn’t touch their property or seek to meddle in the institution of slavery, the Creole elite had been effectively co-opted, and would remain so until the first cannon fire over Fort Sumter. In the final chapter the author follows the politics of slavery in Louisiana, and elsewhere, right up to the point of the Emancipation Proclamation. Thereafter he describes the eventual loss of this slave revolt to history, moving deftly through the various Marxist, collaborationist, and local histories and their various perspectives on this, and all slave revolts. 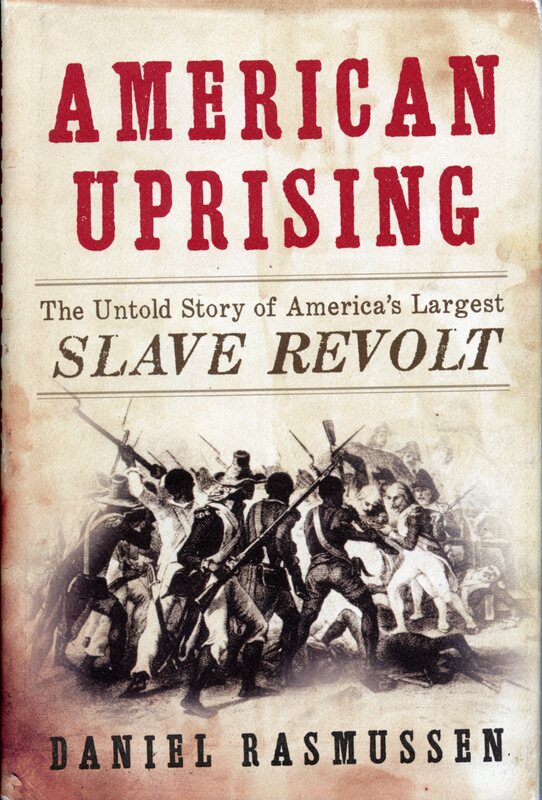 Finally he notes that the absence of this revolt from textbooks is a loss to those seeking to understand various currents in US history including slavery, expansion, cultural hegemony, and also the long and cherished history of American refusal. Finally, our Harvard trained undergrad historian, in seeking to find a modern historical event that resonates with the same themes as the German Coast revolt reaches back to Monroe, North Carolina in the summer of 1957. The local swimming pool, which was forbidden to Monroe’s black population was the initial point of contention in this series of events. A number of black children, banned from the pool, had gone off into the woods and found alternate places to cool off from the searing Carolina sun. Unfortunately this had resulted in a number of accidental drownings, and the local NAACP president, Robert F. Williams decided it was time to fight back. He took, on consecutive days, a number of black children to the municipal pool demanding entry. He and his charges were vilified, jostled, and finally were not allowed entry. The local Klan got involved and on a number of Sundays rode through the black neighborhood shooting out windows and generally being very threatening. Robert Williams, though, was made of some pretty stern stuff. He had fought in Korea, was a member of the NRA, and was not about to let a bunch of crackers shoot up his neighborhood anymore. So he and a group of other black veterans built trenches and fortified positions throughout his neighborhood. On October 5, 1957 the Klan held a large rally in Monroe and then proceeded to get into their cars and drive to the black area in search of some excitement, and they got it. Williams and his men were settled into their various defensive structures and the minute one of the Klansmen fired a shot, they came under fire from numerous positions. The Klansmen backed out of the neighborhood and never returned. The local power structure was stunned at how events had proceeded and the City Council met the very same week to ban Klan rallies in the city of Monroe. Williams was an astonishing personality and the FBI, state investigative agencies and others moved in to scare and harass these black folks into submission. Williams on the other hand was being interviewed on radio and television and saying thing like, “We got no justice under the present system. If we feel that injustice is done, we must right then and there on the spot be prepared to inflict punishment on these people (the Klan).” Williams set off an international firestorm, Malcolm X among others was in full agreement, Martin Luther King Jr. was horrified and the two men engaged in sharp, acrimonious exchanges whenever they met. In Williams’ words to King, after the reverend had refused to join a march in Alabama, “No sincere leader asks his followers to make sacrifices that he himself would not make. You are a phony.” Williams was hounded by the FBI into eventual exile in Cuba and during the Bay of Pigs he sent off a telegram to Adlai Stevenson, the UN ambassador which read, “Now that the United States has proclaimed support for people willing to rebel against oppression, oppressed Negroes of the South urgently request tanks, artillery, bombs, money and the use of American airfields and white mercenaries to crush the racist tyrants who have betrayed the American Revolution and the Civil War. We also request prayers for this undertaking.” No reply was forthcoming from Stevenson. As the author indicates Williams and King promoted vastly different strategies, though the goal of equality was consistent for both men. And, like Kook, Quamana and Charles Deslondes, Williams was ready to take up arms against the US in order to achieve his goals. They fought US government agents, and suffered either exile or execution for their actions. 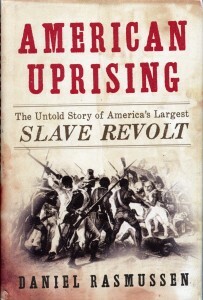 The author points out that these lost histories of violent refusal, as opposed to non-violent non-cooperation, are central to an understanding of the United States, and to understanding the views of those who stand outside history and society, and hence are in a unique place to undermine the entire system. This volume, then, may be something more as well, perhaps the language and understanding of violent refusal is beginning to make its way into the corridors of the institutions whose role is to train the ruling elite. If this book had been written by a student at Berkeley, that would have been expected, but as the product of a Harvard undergrad maybe we are indeed seeing cracks all along the increasingly fragile neoliberal system. No surprise that the tales of slave rebellions in the Americas, such as this one, are not covered in history books. Thanks for an excellent review.